I never considered myself a big vegetable lover . . .until now. 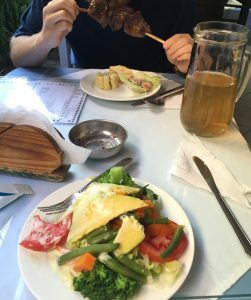 When Peter and I were in Mexico, we considered vegetables a rare gem in our meals, and I squealed with delight any time I saw one. If you think about the classic Mexican food- enchiladas, beans, tacos- what vegetables do you find? A quarter of a tomato? A sliver of lettuce? Not very many nutrients when you are eating Mexican three times a day. Other countries aren’t great with vegetables either, or perhaps it’s just because we eat out nearly every meal, which I’ll get to later on. I’ve begun taking a multi-vitamin to try and meet my body’s daily nutrient needs. It’s not a great fix, but every little bit helps. 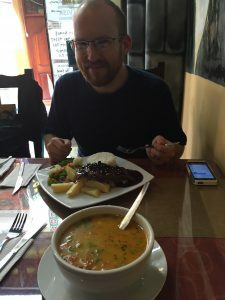 Towards the end of Mexico, we began eating other ethnic foods more often just to switch things up and hopefully get some more vegetables in our diets. You can also go to the store directly to buy your vegetables, but make sure to wash them with clean water. Which brings me to the next issue . 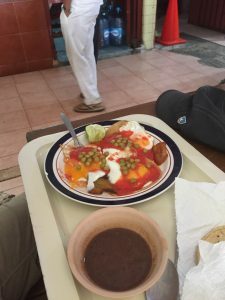 . .
Amazing Huevos Rancheros! Sadly, the only vegetables in this thing were the peas on top. I would love to just order a salad with every meal or eat it for lunch each day to keep my nutrients up and my calories down, but in developing countries where the water isn’t safe from the tap, you CAN’T eat raw fruits and vegetables. Ugh. This is because the locals wash their fruit and vegetables with the tap water so you put yourself at risk of getting something from the water. (This may have been one of the rules I broke and paid the price for later . . . . ) You have to stick to only fruits that have been peeled (in front of you), and as for vegetables, they can only be boiled or cooked. Goodbye fresh salads. While I’m on the topic of the unsafe water, another problem we’ve faced is avoiding drinks with ice. This one has been especially hard for me because you order a drink and the waiter often comes out with a glass full of ice and pours your drink into it before you can say anything. You also have to remember to avoid all blended drinks as well, and frozen lemonade is one of Peter’s favorites. Peter tried Alpaca in this meal! I was already sick by this point, so I stuck with a delicious vegetable soup. I’ve hit the point where I’m getting really tired of eating out all day every day, but I feel forced to continue doing it, regardless. First off, since we spend most of our nights in hostels, sometimes we don’t even have the option of a kitchen. Although most hostels offer a kitchen, not all of them do. The bigger issue is that even when they do offer a kitchen, it’s not well equipped: pots and pans are dirty, strainers are missing, knives are dull, etc. Nobody likes searching around an unfamiliar kitchen for a half hour trying to find every spoon, plate, cutting board, etc they need to make a dish. Eating out just seems so much easier when you’re hungry. In case I needed more incentive, eating out is often cheaper in developing countries than making my own food. Peter and I don’t stick around a place long enough for groceries to make a lot of sense, plus we’re usually sharing the fridge space. It could cost us $15-20 USD to buy all the ingredients for a meal and take an hour to make it, or we could go out to eat for less than $10USD in the next five minutes. We often end up doing the latter out of convenience and frugality. Slow down. 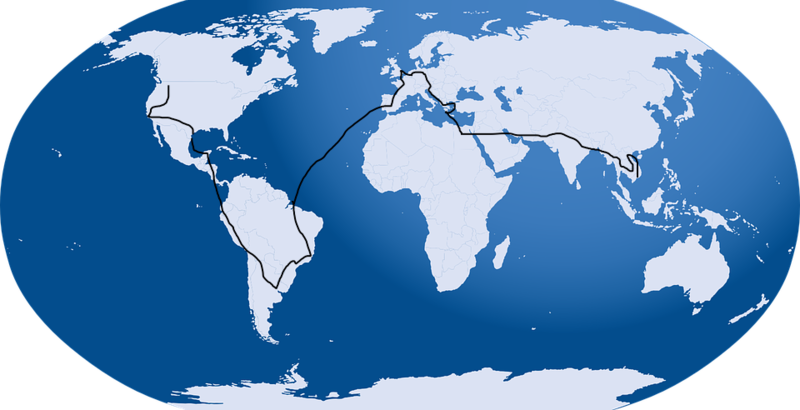 In our next country, Argentina, we plan to stay in Buenos Aires for two weeks and get an apartment. We want to focus on living more like locals and going grocery shopping and making our own meals. There is also more of an incentive in Buenos Aires because I hear it’s cheaper to buy your own groceries due to inflation. Any time you can spend more than a week in one place, you’re going to have more of an opportunity to cook your own meals. If you are stuck eating out like we have been, just be mindful of where you choose to eat out- avoid too many fast food restaurants, and try to get the healthier options on the menu. You don’t have to finish your entire plate if you’re full either. (In some cultures it’s offensive when you don’t eat it all, but you can take that risk.) Speaking of your food . . . I was lucky to get a salad of boiled vegetables. I should not have eaten those fresh tomatoes though. Peter is enjoying cow heart in the background. You can see who the adventurous eater is of the two. As someone who needs to avoid gluten, eating out has been very difficult. Back home, I can expect that most restaurants I go to will offer a gluten free option. I’ve gotten used to enjoying pizza, sandwiches, and cookies just like everyone else. It’s been hard to shift to a place where “gluten free” hardly registers in the culinary dialogue. Peter and I also traveled briefly with a vegetarian and all she seemed to be able to find was pizza and beans and rice. 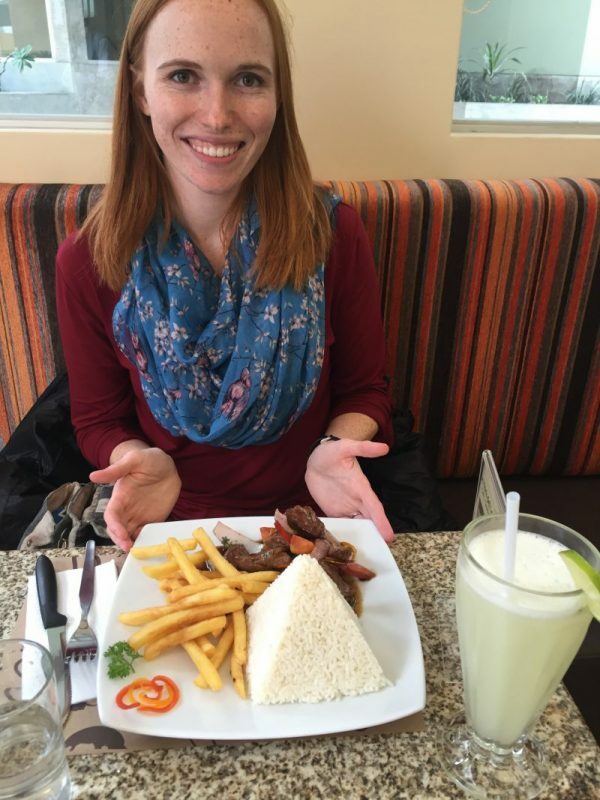 There are some amazing foods in Central and South America, but if you have dietary restrictions, know the words of what you need to avoid in the local language. Also, start looking for food before you get too hungry because it’s going to take you longer to find something that works. You may have to settle for the same types of food more than you’d like. The good news is that I have seen gluten free and vegan restaurants on our travels, so they’re getting here (slowly). 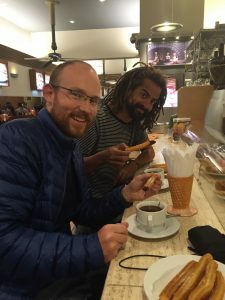 Peter and our friend Gabriel enjoying churros and chocolate. I admit to having a few bites, but I try to avoid the temptation as much as possible. If I’m honest, I’ve been a bit horrified by the sanitation practices in many of the countries we have visited. It’s typical for bathrooms to have no soap or toilet paper in public places (although luckily most restaurants have these things). In Mexico, where the temperature was over 100F degrees, we visited a market with meat hanging out all day and flies buzzing around it. You can never be certain the restaurant you picked is practicing safe food preparation and sanitation. Peter and I look for the crowds- specifically the locals. If we find a restaurant that looks decent but there is no one inside, we don’t eat there because it means the food has been sitting out too long. The locals are going to know the good places to eat, and when there are a lot of people, you know the food is fresh because it’s constantly moving. I’ve heard that ideally you should look for mothers and kids eating at a restaurant, but if it’s really busy, that’s usually good enough for me. 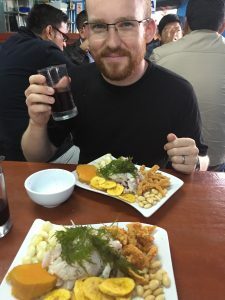 Ceviche is the national dish of Peru, and it’s world renowned. Technically, we shouldn’t have eaten it because it’s raw fish. However, if you HAVE to try it, make sure to go to a restaurant recommended by a trustworthy local and eat it before noon. Trying new foods is one of the best parts about traveling, and I’ve had some amazing dishes since leaving my home. Some digestive issues can be expected while adjusting to the new cuisine, but as long as you are thoughtful about what you eat and drink and where, you should be able to avoid the mess I got myself in last week. If you have your own tips for eating healthy abroad, post them in the comments below. Bon appetite!